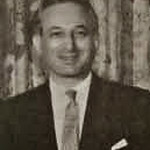 Joe Lazarus, who died early in May, was the leader of a quartet of Manchester Bridge players, who, for over a decade, dominated the Northern bridge scene and later achieved national prominence in the game. In the late 1940's and early 1950's, Joe, in partnership with the late I.M. "Sonny" Morris, together with Ben Franks and Sam Blaser, won every event of local and County significance in the North of England. National victories however eluded them until they changed partners so that Lazarus partnered Ben Franks and Sonny Morris partnered Sam Blaser. The change worked wonders and the quartet (which later became a quintet when Frank Farrington joined them) burst into the national bridge scene. Lazarus and Franks won (in some instances several times) the Tollemache cup, the Pachabo Cup, Crockford's Cup, the Gold Cup and the Masters Pairs. They represented England in several Camrose Matches and played for Great Britain with great distinction in the 1959 European Championships, when Great Britain finished third. Joe's hallmark at the bridge table was to make as few mistakes as possible. His forte constant care and attention to detail. Nothing at the table would escape his careful consideration and his partners and team-mates were subjected to a rigorous check after each match. He was an excellent and conscientious team captain and was a model of propriety and courtesy at the table. In later years he gave up tournament bridge but remained a formidable rubber bridge player to the end of his days.